The driveway to Eling Forest cafe is right on the Hume Highway. Photo by Maryann Mussared. Over the decades, I have travelled the Hume Highway between Canberra and Sydney hundreds of time. Stop-over options in the dim past were different and the road is now much faster than it was in the 60s and 70s. Many travellers felt the need to stop more than once as the journey could take well over four hours. For decades I was a regular visitor to Goulburn, but the completion of the by-pass in 1992 means I now rarely go to the Paragon cafe to enjoy milky cappuccinos and Kraft cheese grilled on toast. I remember my short-lived excitement when Maccas opened at Sutton Forest; however, it has proven to be too busy, especially on weekends, during the ski season and school holidays. I tried BYO Thermos, sampling parks in Marulen and Mittagong, as well as the various ‘VC’ stop-overs along the highways. I flirted with the bus; the very slow train; and puzzled over why I would fly when it takes just about the same amount of time to drive. Nowadays, my preferred method of travel to Sydney is by car. As a responsible driver, stop and rest I must, and that is every two hours. I no longer have the patience to leave the highway and travel into busy Moss Vale, nor even busier Bowral, even though I like visiting both of these towns and their shops. 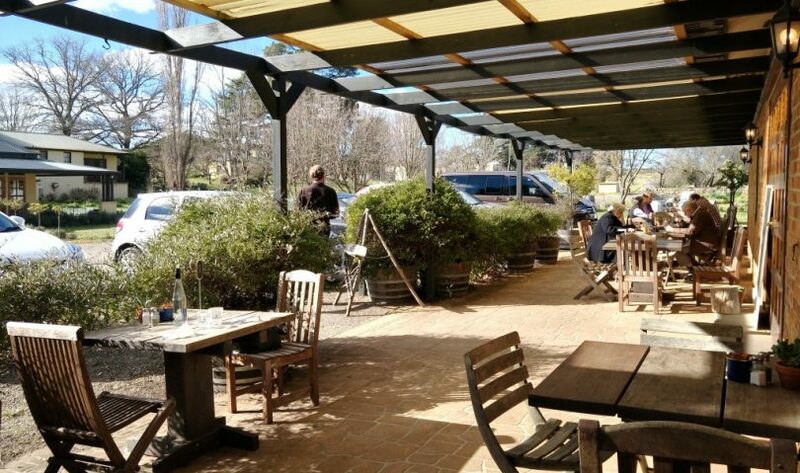 Bowral, in particular, is congested and has limited parking; and the restaurants are usually busy with locals, especially on weekends. In winter I particularly miss The White Horse Inn in Berrima, and generally, parking on the weekend can be an issue in this pretty historical village. So here are a couple of suggestions to try and both are just about halfway between Canberra and Sydney and perfect spots to rest, revive and survive. Sutton Forest Estate cafe has a lovely big open fire. Photo by Maryann Mussared. 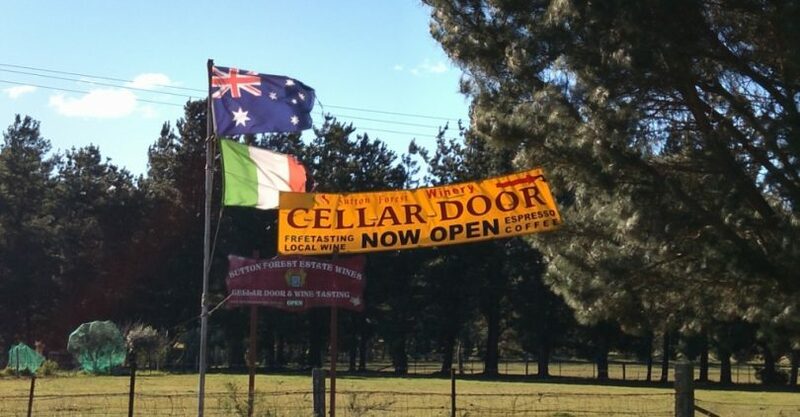 The first is the Sutton Forest Estate Winery and cafe, proudly flying Australian and Italian flags, and set in a vineyard behind the main Maccas carpark at Sutton Forest. 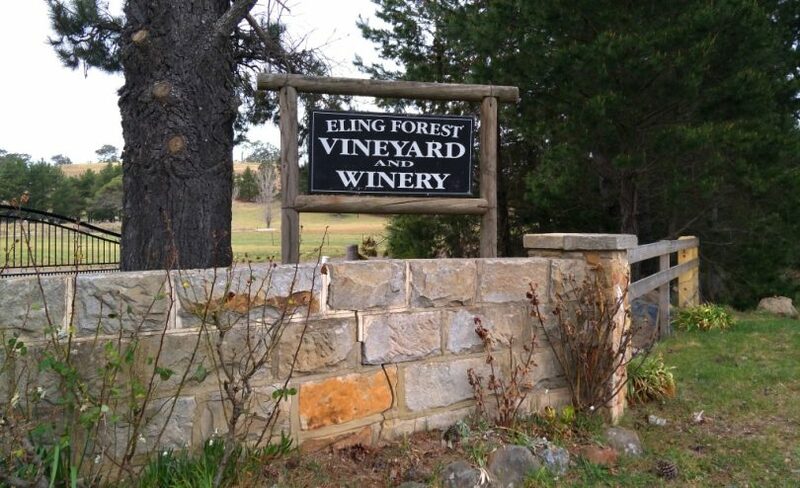 The second is the cafe at the historically significant Eling Forest Vineyard and Winery. The GPS coordinates (34.5692° S, 150.2556° E) are now saved into my SatNav, but coming from Canberra it is 500 metres past Black Bob’s Creek and returning from Sydney it easy to spot after passing the Berrima turnoff. I asked friends if they had been to either of these places and was pleased they were known and popular – and not just as stopovers. I discovered friends who sometimes meet Sydney family halfway for a lunch-time get-together and others who regularly swap children midpoint at the beginning and end of school holidays. What most want is somewhere they can stop, park easily, have a bit of outside space, and get something simple and inexpensive to eat. Others seeking interesting stop-overs are those travelling with visiting friends who would like to show something that is a bit more interesting than the inside of Maccas! Sutton Forest Estate Winery is hidden in behind Maccas at Sutton Forest. Photo by Maryann Mussared. I now have a set routine. 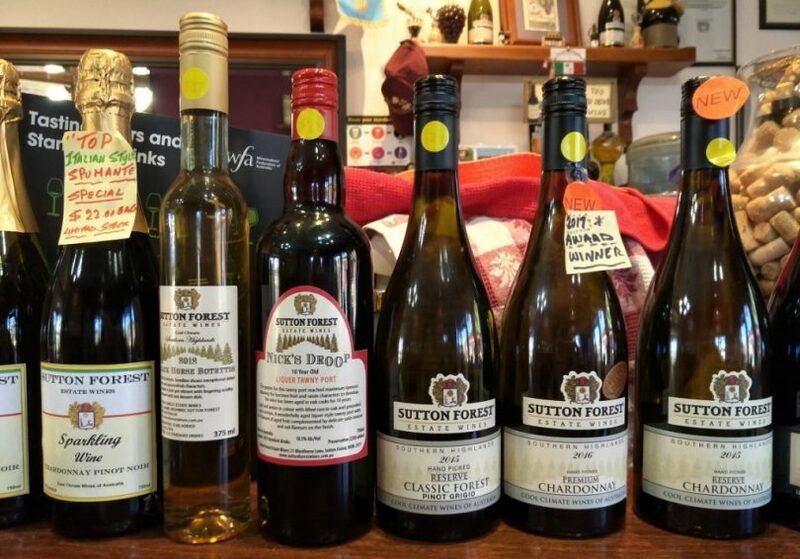 Going north to Sydney, I stop at Sutton Forest Estate Winery. This homely establishment is only open Friday to Sunday for coffee and lunch, which suits me. Nick and Sandra Lo Rosso provide a warm welcome at Sutton Forest Estate. Photo by Maryann Mussared. 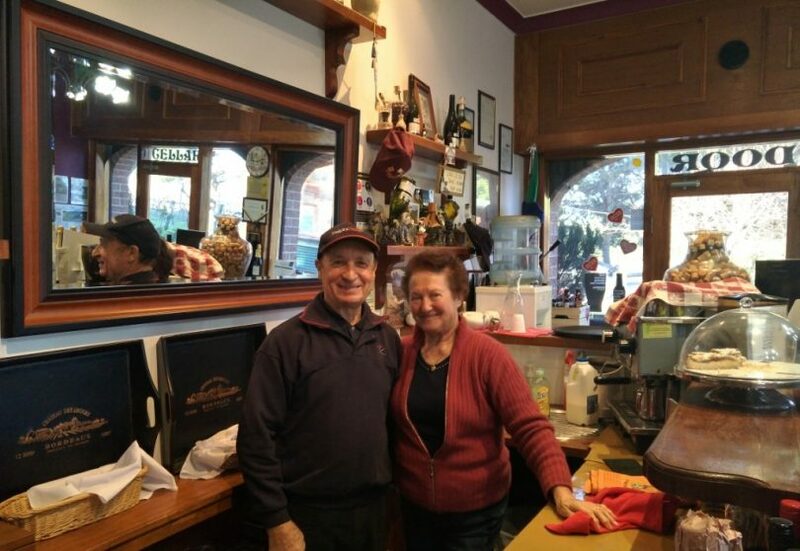 Sutton Forest Estate is a small boutique winery and the cafe is also fairly small, usually with just Nick and Sandra on duty, but do expect some warm Italian hospitality. They offer a short lunch menu, and good homemade cakes and coffee. As with all popular places with a faithful following (and customers are not just the travel weary – there are often locals there), it is wise to book if you want to lunch and stay awhile. Simple home-cooked Italian fare. Photo by Maryann Mussared. I am a great fan of Sandra’s Tiramisu and even (wickedly) eat it in the middle of the afternoon with a good coffee. 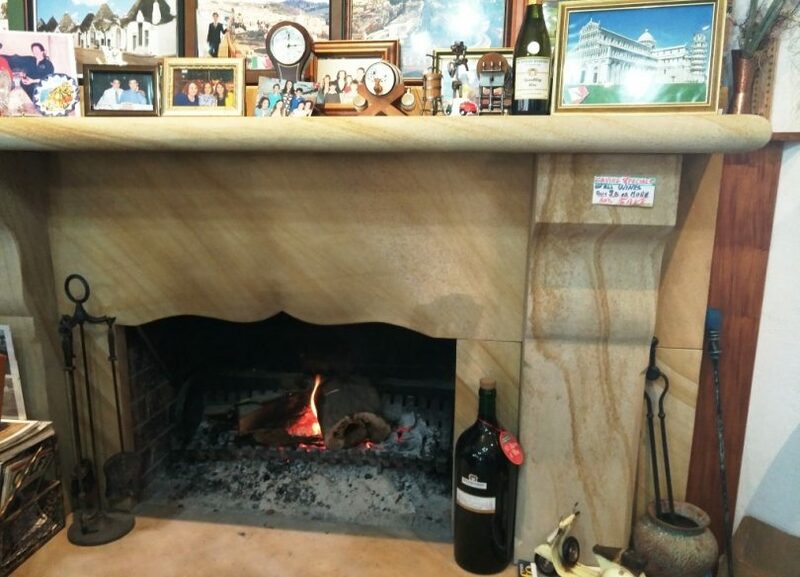 The cafe doubles as a tasting room for the interesting range of Italian-style wines. I wonder how many of us have driven by it for the past ten years and not investigated, perhaps put off by the distraction of a wine tasting? I have only once given in and had a quick tasting, and left with some bottles of their excellent Black Horse Botrytis Semillion 2012. Outside, there are tables in a shady pavilion and on the lawn with views over the small vineyard and some sweet miniature horses to visit. Pick a designated driver and try the Pinot Grigio or Chianti. Photo by Maryann Mussared. 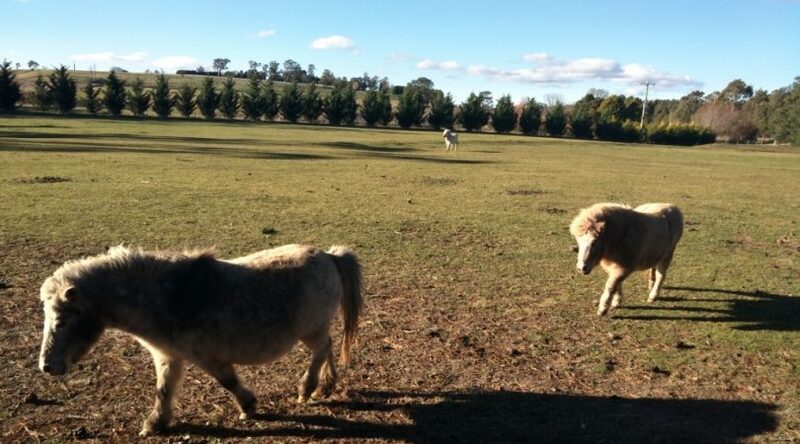 Meet some miniature horses at Sutton Forest Estate. Photo by Maryann Mussared. Returning from Sydney, my choice is Eling Forest Winery with its popular cafe and efficient kitchen service. 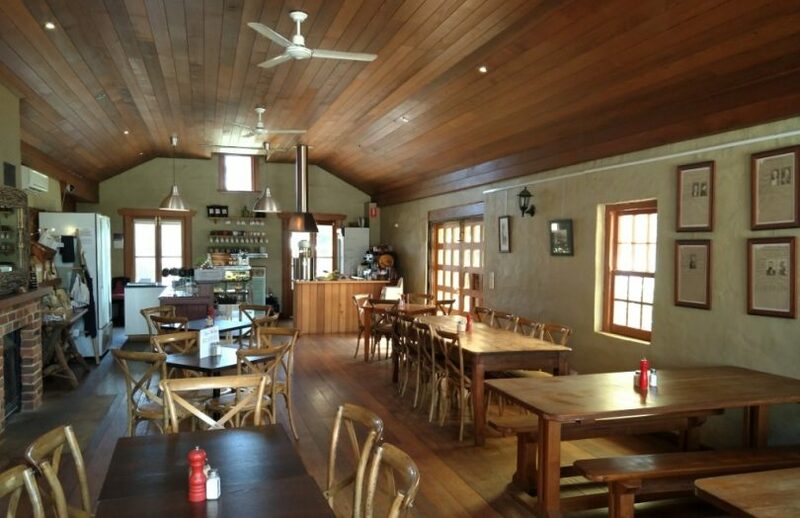 There is plenty of space inside, with a warm open fire in winter and rustic wooden seating. Outside the terrace catches all the winter sun. Even in winter, the sunny and sheltered terrace of Eling Forest cafe is nice for a relaxed lunch. Photo by Maryann Mussared. It is a welcome stopover after surviving the Sydney traffic and busy exit from the western suburbs of Sydney. 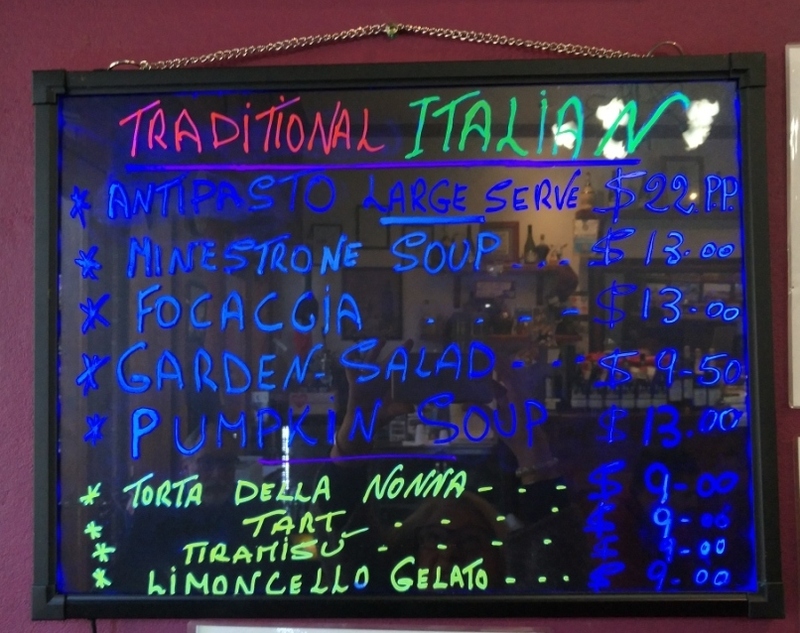 The cafe is open every day with an interesting menu, including pasta, excellent burgers, salads and specials of the day. They are proud of their coffee, roasting the beans in-house, and you can pick up a bag to take home. With spacious gardens and pretty rural views, there is parking right at the door and plenty of overflow parking off the driveway. Eling Forest cafe provides inside and outside dining options. Photo by Maryann Mussared. 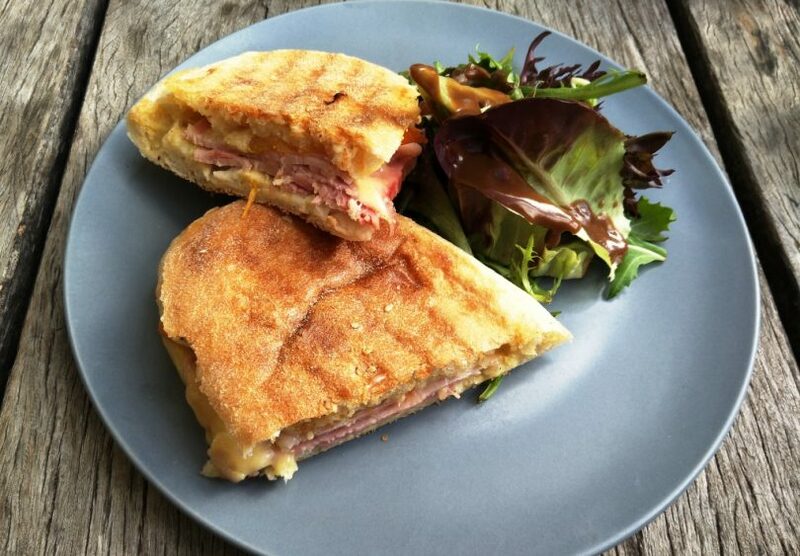 A delicious morning snack is freshly cut ham with Robertson cheese on Turkish bread. Photo by Maryann Mussared. 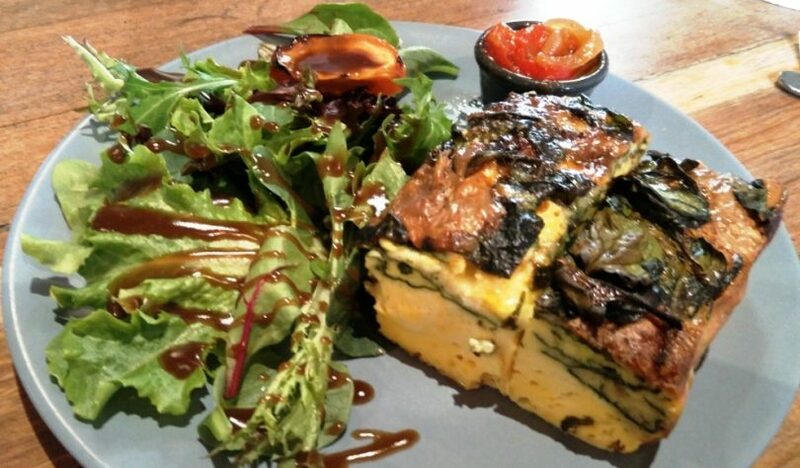 Even a hearty piece of triple cheese frittata with capsicum chutney and fresh salad will satisfy the hungry. Photo by Maryann Mussared. 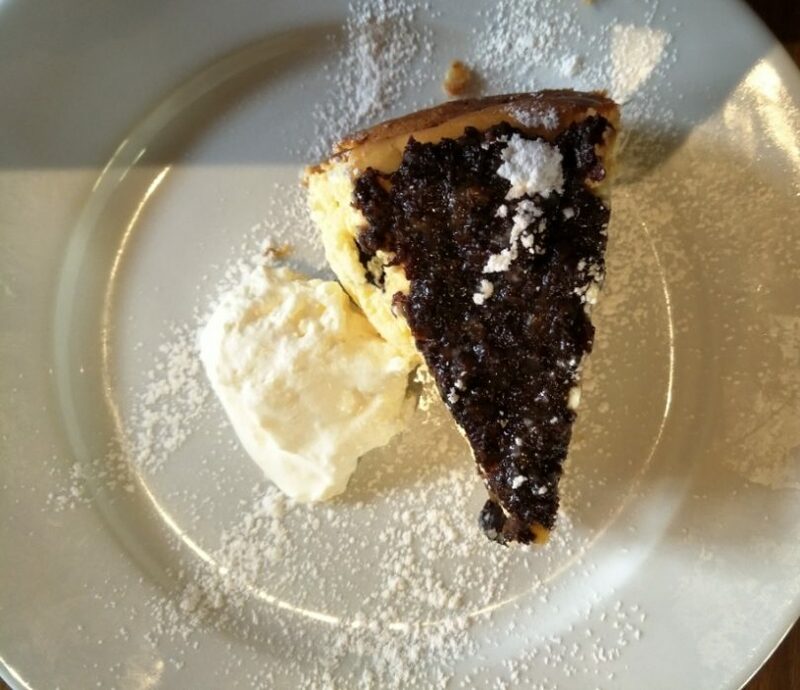 Russian Cheesecake topped with raisins and poppyseeds. Photo by Maryann Mussared. If you would like a glass of wine with lunch, there is a tasting room located just at the rear of the cafe, selling a number of local wines, including ‘Tractorless Vineyard’. There are a number of heritage buildings, including the original 1840s homestead. 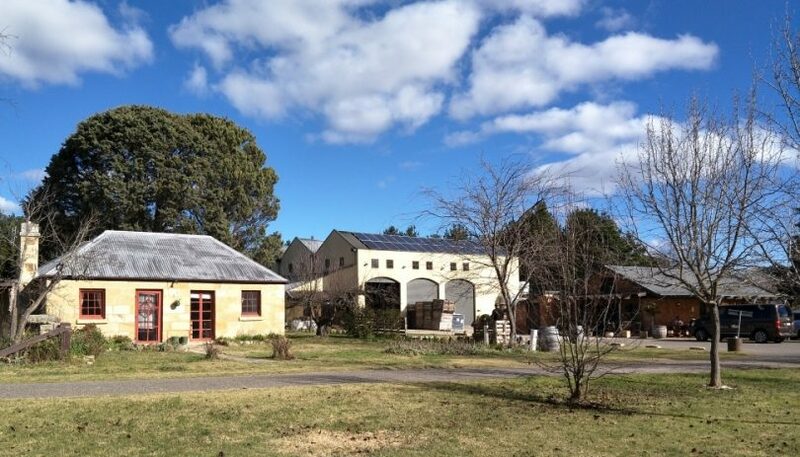 The Winery is a popular photo stop for an increasing number of overseas tourists and is a popular wedding venue, with accommodation also offered. Eling Forest has a number of heritage buildings that will appeal to many including the Headmaster’s Cottage. Photo by Maryann Mussared. Both these establishments make my regular commuting just that bit more bearable. I know lots of commuters take time to turn off the Highway to visit some of the regional towns, but I figure the extra half-hour driving to find somewhere to eat could be spent in a rural environment at these very pleasant stopovers. I know there are other commuter favourites just off the Highway. Do you have any recommendations? Please share your suggestions in the comments below.